Roasted or toasted pecans are a staple in the South, and when a southern recipe calls for roasted or toasted nuts, you can almost bet it will be pecans. Roasted pecans can typically be substituted for other nuts in a recipe; just the other day I made an Easy Homemade Southern Basil Pesto, using pecans instead of pine nuts. In the South where pecans are grown, roasted, salted pecans are likely to be present at baby and wedding showers, cocktail parties, tailgating or just about anywhere folks gather and munchies are served. This is especially true around the holidays. 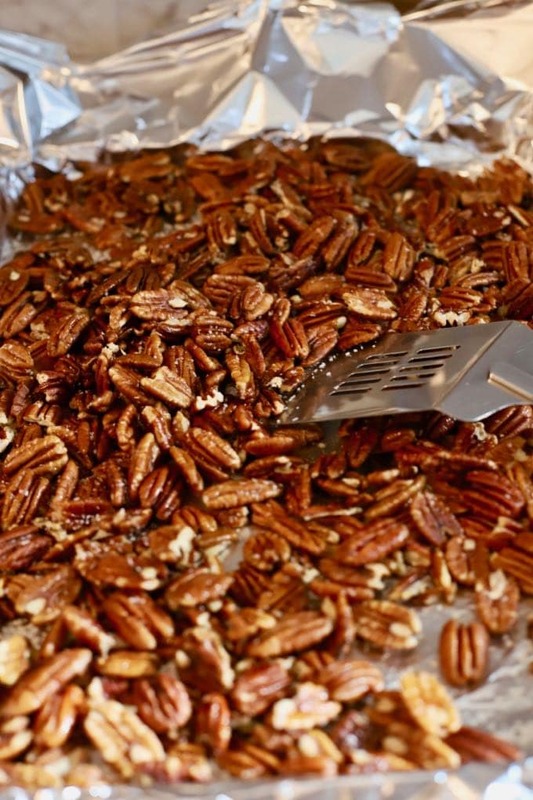 Roasted pecans also make a terrific homemade gift for the foodies in your life. Roasted pecans are also one of the easiest, healthiest, and quickest snacks or appetizers to make. I always have some in my freezer for recipes that call for roasted or toasted nuts, salad toppings or for just plain snacking. Roasting or toasting pecans in the oven brings out their natural oils and intensifies their rich, irresistible, nutty flavor. Pecans that are just harvested or very fresh take a little more time to roast because they have more oil and moisture in them, while older, drier pecans take less time. If you are planning to roast your pecans, always use pecan halves. Pecan pieces will burn easily due to their small size. Whether fresh or roasted, pecans should be stored in airtight plastic bags in your refrigerator or freezer when you bring them home, unless you plan to use them right away. Pecans will turn rancid very quickly especially in hot, humid climates. When stored in a refrigerator, pecans will keep for several months, and they will keep up to a year in the freezer. Pecans can be added to your dishes while still frozen as they will thaw very quickly. When I use pecans in baking, I always roast them, whether the recipe calls for it or not, and think the flavor is much improved. When are pecans in season, or harvested? Generally, pecans are harvested in October and November. Pecan groves are beautiful with their stately trees and green foliage, and line many roads in South Georgia, the state which produces the most pecans. When I was growing up we had a number of pecan trees in our yard, and we spent many a fall day picking up pecans and shelling them. Of course, it was much more fun picking them up, and we weren’t nearly as enthusiastic about the cracking and shelling part. 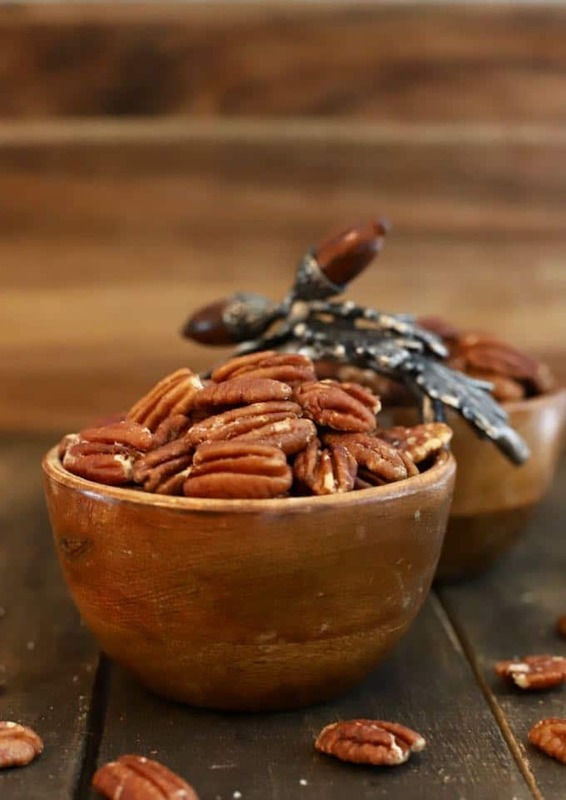 Back in the day, it was very common to see a bowl of unshelled pecans along with a metal hand-cracker, sitting on the table in southern kitchens. How many varieties of pecans are there? There are over 500 varieties of pecans, although only a few varieties are harvested commercially. The basic difference in all of the different varieties is the size of the nut and the thickness of the shell. Stuart pecans are the most popular, at least in our area. Papershell pecans, named because of their paper-thin shell, are the easiest to crack. These days, I have to admit I’m spoiled and buy my pecans already shelled. 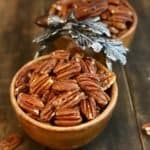 In the fall, when fresh pecans are available, I usually buy at least 10 pounds and stick them in the freezer, to pull out later and use in recipes throughout the year. 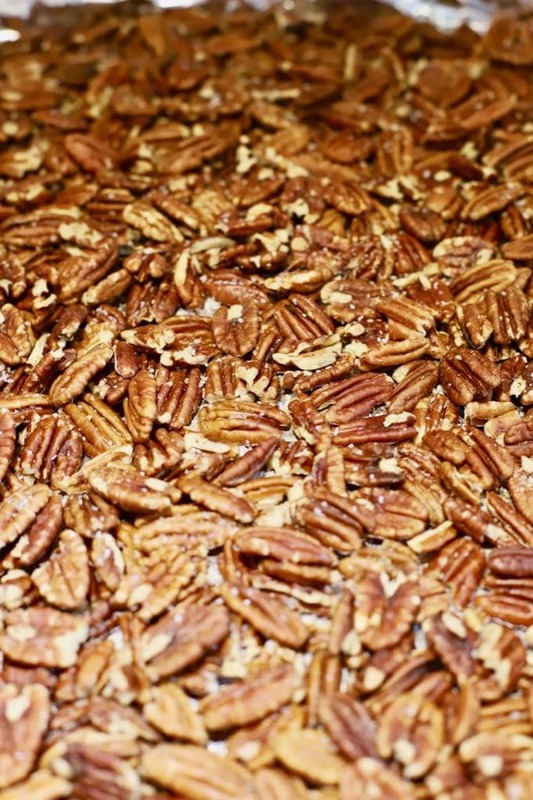 Looking for recipes using roasted pecans? Check out these delicious and popular recipes on my blog featuring roasted pecans: Dot’s Ultimate Southern Pecan Pie, Southern Pecan Praline Cheesecake, Healthy Wild Rice Chicken Salad, and Easy Southern Broccoli Salad. Need more ideas, just type “pecans” in the search box! How to roast (toast) pecans in the oven. 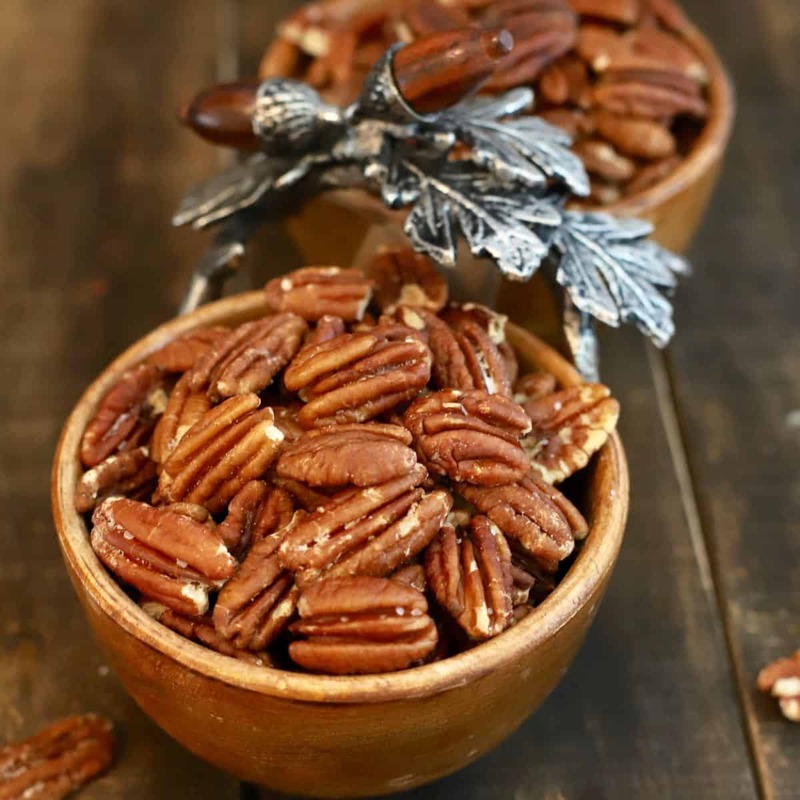 This roasted pecan recipe is one of the easiest on my blog and only requires three ingredients: pecan halves, unsalted butter, and kosher salt. You will also need a rimmed baking sheet and optionally, to make clean-up easy, either parchment paper or aluminum foil. First, preheat your oven to 325 degrees F.. The low temperature is essential to maximize the flavor of the pecans. Spread out the pecan halves in a single layer on a rimmed baking sheet lined with either aluminum foil or parchment paper, and top with chunks of butter. Place in your oven and bake for approximately 10 minutes. 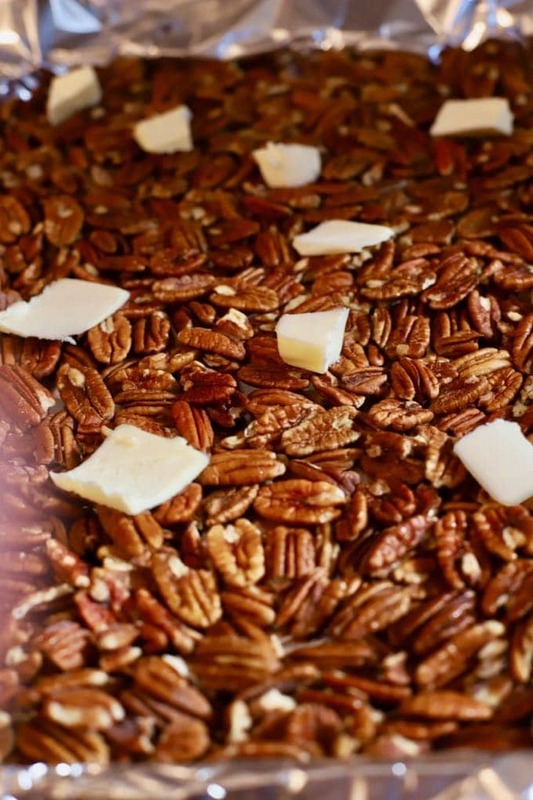 Remove the pecans from the oven and stir to make sure they are all coated with the melted butter. Sprinkle lightly with about a teaspoon of kosher salt or sea salt flakes. Add additional salt if desired and allow to cool completely. Store the roasted pecans in an airtight container at room temperature for about 1 week or freeze in a plastic storage freezer bag for up to a year. PS: I use this recipe for roasting or toasting pecans most often, especially when I plan to serve them whole as appetizers or snacks. If you are just using them as an ingredient in baking, and you are in a hurry, you can speed up the process by increasing the oven temperature to 350 degrees F. and then roasting them for 10-12 minutes. But watch them carefully, they can burn in seconds. *This recipe was originally posted December 17, 2015. I have updated it by adding additional information and included new photos and repulbished on September 27, 2018. Roasted or toasted pecans are a staple in the South, and when a southern recipe calls for roasted or toasted nuts, you can almost bet it will be pecans. Roasted pecans are also one of the easiest, quickest and healthiest snacks or appetizers to make. When roasting pecans, always use pecan halves and then chopped them up after roasting. Pecan pieces burn easily due to their small size. 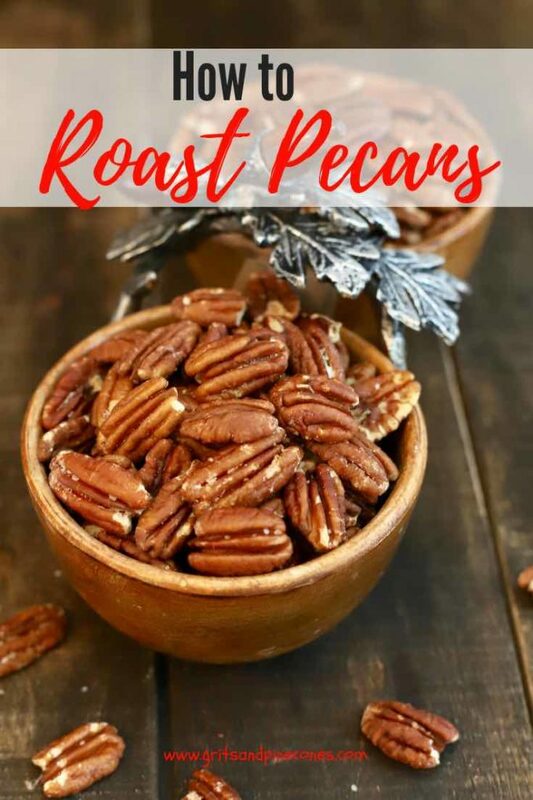 I use this recipe for roasting or toasting pecans most often, especially when I plan to serve them whole as appetizers or snacks. If you are just using them as an ingredient in baking, and you are in a hurry, you can speed up the process by increasing the oven temperature to 350 degrees F. and then roasting them for 10-12 minutes. But watch them carefully, they can burn in seconds. Nutritional Values are calculated for one cup of roasted pecans.